Custom hats are a great way to express your brand through your employees and promote your business when out and about. 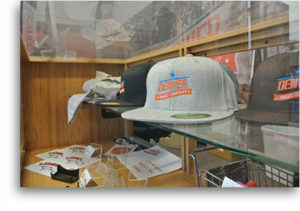 Denver Print Company offers a large selection of sizes, shapes, fits, styles and colors of hats. With over 200 different choices of hats and headwears, we guarantee we have the right hat for you. Getting started is easy: Submit the logo or graphic you would like applied to the hat as well as the specific location you would like to have printed. Our current equipment is limited to digital embroidery on the front, sides or back of the hat or beanie. Embroidery has a great look and feel. Denver Print Company requires printing a minimum of 24 hats per order, but will take a smaller order for testing purposes. You might have some great ideas for custom hats but don’t have the artwork prepared or the knowledge to create the pattern in a design program. Denver Print Company has a full staff of graphic design professionals who are more than capable of helping you develop your concept and turn it into a workable print file. With over 15 years combined experience, we have designed hundreds of t-shirt and hat designs over the years. Embroidery requires a unique program that "digitizes your artwork" this process converts your artwork into a sewing pattern. Allow your hat to have greater impact by investing in professional graphic design. A great hat design can be of use for many years! We also specialize in converting flat logos into printable artwork for screen printing and embroidery. Standard turnaround on all apparel orders is 10 - 12 business days from the confirmation of digital or printed proof. Why should i get hats?